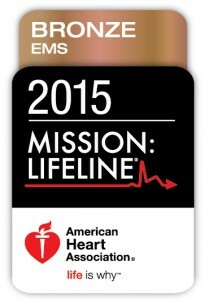 The Virginia Beach Department of EMS received the American Heart Association 2015, Bronze Mission Lifeline Award. This award recognizes first responder performance when caring for STEMI patients and is the first time that Virginia Beach EMS has achieved such status. Virginia Beach is one of 16 agencies in Virginia to be recognized. Percentage of STEMI patients transported to a STEMI Receiving Center, with pre-hospital First Medical Contact to Device (PCI) < 90 Minutes. The Virginia Beach Department of EMS received the American Heart Association 2017, Gold Mission Lifeline Award. Agencies earn Gold recognition with a minimum patient volume of at least 8 STEMI patients transported directly to a STEMI Receiving Center for Primary PCI and/or STEMI Referring Hospital for fibrinolytic administration and for achieving 75% or higher adherence over at least one consecutive 24 month interval. Our participation in Get With The Guidelines®/Mission: Lifeline® demonstrates our commitment to quality care. We are proud to be a part of the American Heart Association’s® efforts to turn guidelines into lifelines. Virginia Beach is dedicated to helping our patients achieve the best possible outcomes, and implementing the American Heart Association/American Stroke Association’s® Get With The Guidelines®/Mission: Lifeline® program will help us accomplish that by making it easier for our providers to put proven knowledge and guidelines to work on a daily basis. 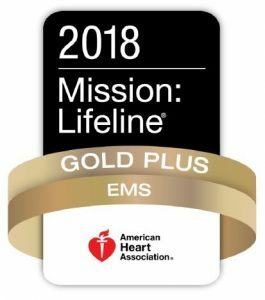 Virginia Beach Department of EMS received the American Heart Association 2018,Gold Plus Mission Lifeline Award. 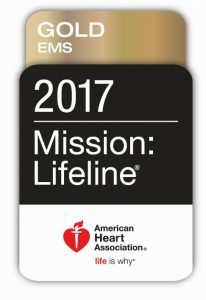 In addition to meeting the above requirements, Virginia Beach EMS also achieved at least 75% on the 2018 Plus Measure (The Measure is the Percent of adult Out-Of-Hospital Cardiac Arrest patients resuscitated on scene with sustained ROSC of at least 20 minutes, maintained to arrival at the emergency department, who has a 12 lead ECG performed in the field).